Commemorating the 50th anniversary of the legendary Star Trek franchise, La-La Land Records proudly announces the STAR TREK 50th ANNIVERSARY STARFLEET INSIGNIA-SHAPED DIE-CUT 12’’ VINYL SINGLE, featuring Star Trek: The Original Series Season One and Season Three Main Title themes on 180 gram, gold-colored vinyl, die-cut in a shape inspired by the iconic Starfleet Insignia. In 1966, the Season One Main Title from Star Trek: The Original Series beamed throughout the heavens for the very first time, heralding the launch of the Starship Enterprise and a television program that would weave its way into the human experience forever. That defining moment is captured and celebrated on this very special, collectible release. 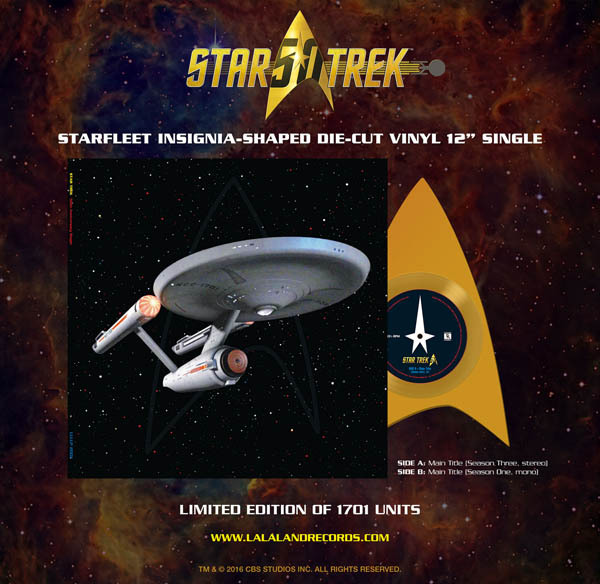 Die-cut from a 12’’ vinyl disc, this Starfleet Insignia-shaped single features The Main Title (Season Three – Soprano Version, long ending, stereo) on Side A (1:01), and The Main Title (Season One – Cello Version, short ending, mono) on Side B (0:51). The golden-hued single stands 10 3/8’’ tall and 6 ¼’’ wide, and is housed in an attractive jacket showcasing the iconic Starship Enterprise in fight, within the vast wonders of space.